1 of 4 In small bowl, blend chunky peanut butter, minced garlic cloves, hot water, light-brown sugar, rice vinegar, low-sodium soy sauce and red pepper flakes. 2 of 4 Place chopped iceberg lettuce in a large bowl and add sweet red pepper and scallions. 3 of 4 Drain tofu and cut into 1-inch squares. Pat dry with paper towels. Place cornstarch in a pie plate and coat tofu with cornstarch. 4 of 4 Heat vegetable oil in a large nonstick skillet over medium-high heat and cook tofu for 10 to 12 minutes, turning often, or until golden brown. 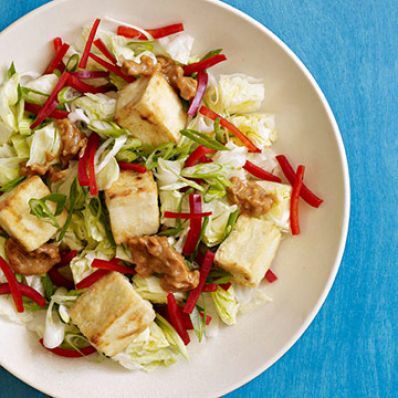 Add tofu to bowl; drizzle with dressing. Per Serving: 1 g sat. fat, 4 g fiber, 31 g carb., 14 g pro., 14 g Fat, total, 380 mg sodium, 0 mg chol., 302 kcal cal.